Boost yours with this guide! Research undertaken by the Sales Executive Council shows that no other productivity investment comes close to coaching in improving reps’ performance and revenue attainment. Sales coaching is proven to close the performance gap. Underperforming reps can excel when supported by a coach that provides them with the training, technology and input necessary to grow their skillset. Investing in the development of the Management Team can reap the highest business benefits. Companies that spend more on training managers than salespeople are proven to hit their revenue targets more often. Sales Coaching should be the priority of any sales manager wanting to help their team meet targets. Not only does it accelerate sales performance, effective coaching can also increase retention, improve employee engagement and promote a learning culture throughout the business. Which is why, the fact that sales coaching is often overlooked in many organisations, is so mind-boggling. The reason behind this lack of investment is due to the perceived difficulty in implementing it effectively. For coaching to be truly significant, it must be targeted, timely, relevant and personalised. Hard attributes to get right at scale. 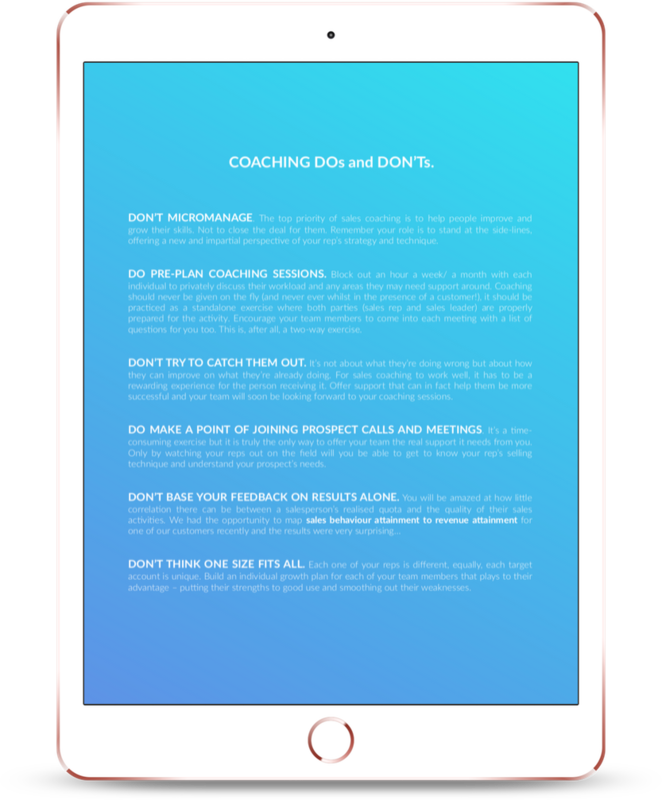 In this free guide we show you the sure-fire ways of creating an effective sales coaching programme that works for every individual of the team by utilising data, understanding behaviours and sidestepping the most common coaching challenges. Learn how to turn your front-line managers into elite sales coaches and boost the performance of the overall team with our ultimate Sales Coaching guide.